I did not find a proper guide over the web and had to troubleshoot my way through when implementing the same. And hence, the following! “There are some tasks that are the need of the hour, while there are some that are not”. Most of the applications we work with use APIs. And thus, API response time is a major metric to the evaluation of application performance, which in turn adds to the business value. To make the response time shorter, the ideal approach would be to execute only tasks required and take minimal time possible to provide the response. But then, we don’t live in an ideal world. Maybe, we want to send emails on an event or we need to notify that other service. But, is it fair to let your user wait for all that? Of course, not. All of those tasks need to be queued for future execution so that the need of the hour can be addressed first. To deal with the above issue, I’ve been using RabbitMQ, as a middleman between applications and asynchronous task workers. Here, we’ll be looking at how to setup RabbitMQ and also some of the tricky issues I faced setting up a rabbitMQ cluster over AWS EC2 instances. RabbitMQ is an open source message broker software or in simple terms, a queue-manager. Applications or services connect to RabbitMQ, they can then, either add messages/tasks to the queue(publisher), or fetch from the queue(subscriber). A communication platform for microservices, you can say. Each running an instance of the RabbitMQ application is a node. A RabbitMQ cluster (or broker) can consist of multiple nodes. All of the nodes will share configuration information, such as users, exchanges, and queues. And here, we are to look at clustering EC2 nodes/instances running rabbitMQ. RabbitMQ is an implementation of AMQP, the emerging standard for high-performance enterprise messaging. The RabbitMQ server is a robust and scalable implementation of an AMQP broker. I’ve setup rabbitMQ with a couple of our applications at Aubergine solutions, to queue our async tasks. The tasks are then received by celery workers and executed. With distributed production servers, we are faced with a major task of monitoring over all the tasks being queued onto rabbitMQ. And primarily, eliminating a single point of failure. Therefore, to avoid a single point of failure and make the system performant, even at scale, we are to form a cluster of rabbitMQ nodes. Now to setup a cluster with more than one nodes, setup rabbitMQ following the similar steps on to other nodes. Let’s attach node-2 to the cluster of node-1. It is a key that indicates that the multiple Erlang nodes can communicate with each other. All the nodes in a RabbitMQ cluster must have the same Erlang cookie. To cluster them together, we’ll first have to stop the node to be attached. Reset node — to break up the node from current cluster. Where the former ip with A’s is your node-1’s public IP. The Erlang epmd (erlang port mapper daemon) will use two ports, one for discovering other erlang nodes (port 4369) and a dynamic range for the actual communication. RabbitMQ invokes Erlang. And so, you still need to configure it to use the same kernel values to epmd. Now, what if one needs to check the cluster or node status, queues, message rates? As the official documentation says- The rabbitmq-management plugin provides an HTTP-based API for management and monitoring of your RabbitMQ server, along with a browser-based UI and a command line tool, rabbitmqadmin. 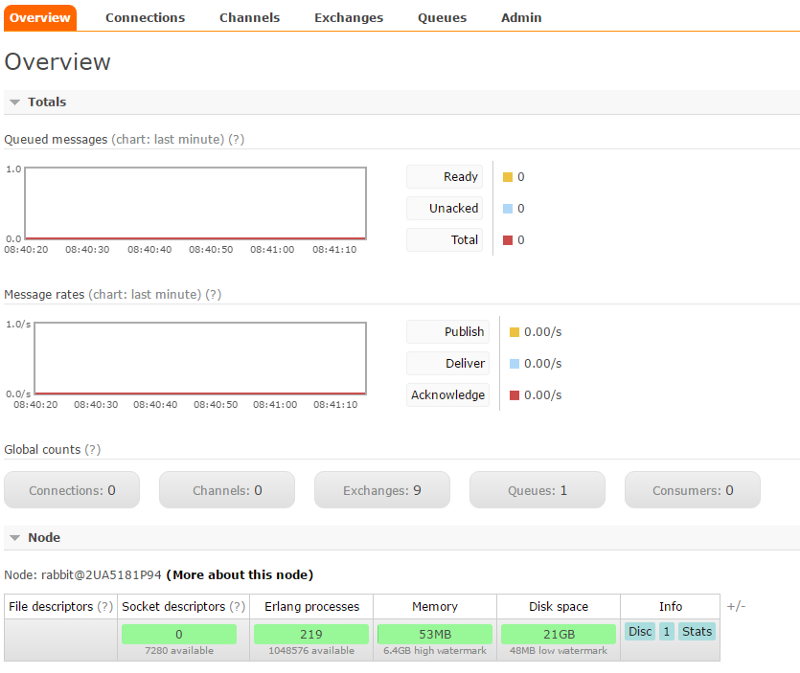 The UI provides with visual monitoring of the rabbitMQ node’s status as well as the graph of incoming and outgoing tasks. That is all. Hope it helps!